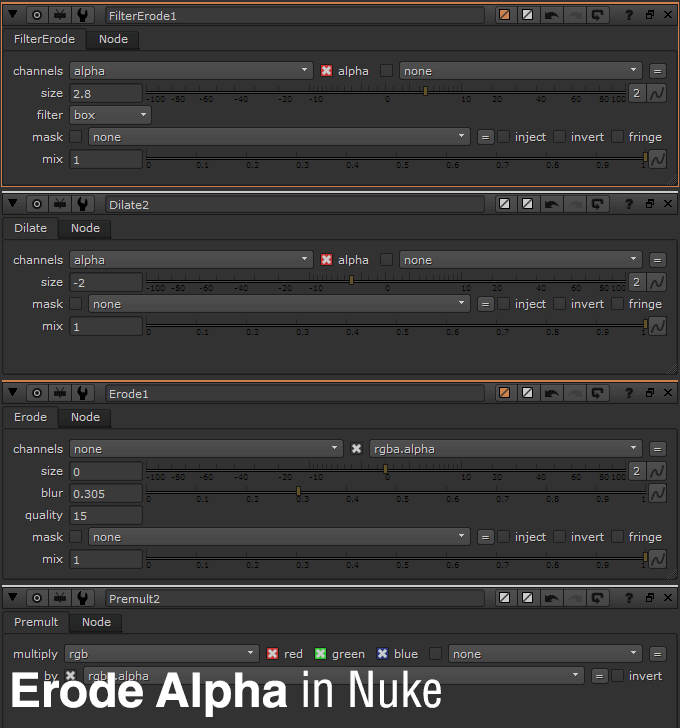 Why erode alpha in Nuke? There are times when keying a scene, you just need some control over the edge of the alpha whether to expand or shrink it by few pixels. Erode (Fast) is the same with Erode (Filter) set to Box filter so I suggest totally avoiding it. Usually I use Erode (Filter) as it has some control over the filtering method when you adjust the erosion. Erode (Blur) lacks the filtering method but instead offer a blur control into it. Well problem is I can always apply a Blur node after the Erode (Filter) to do the same thing as Erode (Blur). Well sadly I find the Erode node in Nuke to be weak compared to third party solutions like GenArts Sapphire which have the awesome MatteOps that offer more controls when eroding with much better quality. It is possible to overcome the Erode limitation by combining several Erode with mask to control how much you need to erode on certain part of the alpha/matte.